When planning a very special event such as a wedding, engagement party or a even a funeral, why not make it extra special by having White Doves Released into the air at just the right time. These beautiful, soaring birds, with their graceful movements and gently flapping wings, cause the onlookers to gasp in wonder at this amazing sight. Nothing could make your event more exciting and surprising than the release of these majestic birds. People will talk about this for weeks and perhaps decide that they, too, would like to have white doves released at their next special occasion. We have a white dove release service connected with our modern, sleek, fleet of limousines and will be able to fill your order exactly as you wish. Let us know in advance exactly what you will need and we will do the rest. The result will be a breath-taking experience for everyone. These birds are specially trained to fly and hover over the event. The trainer will be there and will take care of every aspect of the release. Those who have experienced this have commented that it is magical. To have this at your special event would be thrilling. 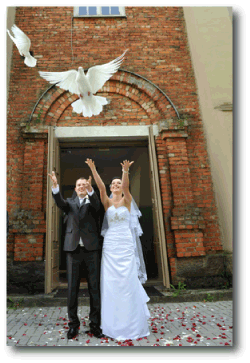 Imagine the bride and groom exiting the church after the wedding to be greeted by the release of our white doves. What a feeling of surprise and excitement they would have! The dove release adds so much to a wedding or other special occasion it is so beautiful to behold. Our white dove release is in great demand and we see to it that everything goes according to the wishes of our customers on their very important day. 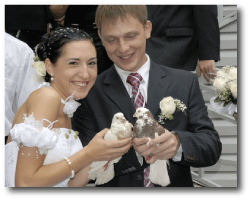 When ordering your limo for that special occasion, remember our white dove release program. This program would add sparkle and fun to the event and we are there at all times during the release. What fun and excitement the white doves will bring to your occasion. After the event is long over, the release will still be enjoyed in pictures. The birds are majestic and float in the air with ease, making a beautiful scene against the sky. Our white dove release limo service is in demand for special occasions and we make sure that the event goes smoothly. We have a fleet of modern, sleek, clean vehicles that are impressive to look at and very comfortable to ride in. Our licensed, professional, limo chauffeurs are at your service and will make your drive a safe and pleasant one. Add to this the White Dove Release for special occasions and you a great event planned! Remember us the next time you need a limo service with an exciting white dove release program.